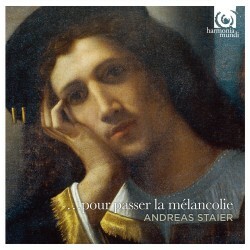 Gapplegate Classical-Modern Music Review: Andreas Staier, "... pour passer la mélancolie"
Froberger, Fischer, Louis Couperin, D'Anglebert, Clérambault, Muffat, Baroque era composer we don't hear as much of today as we should. Harpsichordist-pianist Andreas Staier has given us a long and elegant program of their solo keyboard music on ... pour passer la mélancolie (Harmonia Mundi). It concentrates on melancholy, as you have gathered from the title, the musical representation of it, the transcendence of it, or the acceptance, or the dissection, all something the Baroque (and for that matter, the Renaissance) were often prey to or concerned about. The solo harpsichord was an excellent means to draw such musico-emotional portraits, at once intimate, personal, solitary and expressive. Andreas uses for the recording a particularly resonant, venerable instrument that reportedly was rescued from limbo at the start of our present century.